Local artists and fine craftspeople associated with ChathamArt gathered this evening for pizza cooked on an outdoor grill (plus salads [green and fruit]), and the wine flowed freely. Dinner was followed by cookies and ice cream, plus a confusing but riotous game loosely based on Pictionary, as only artists would interpret it! It was the perfect end for a day spent cutting and stacking wood and moving to my new studio. We’re already planning our next gathering. 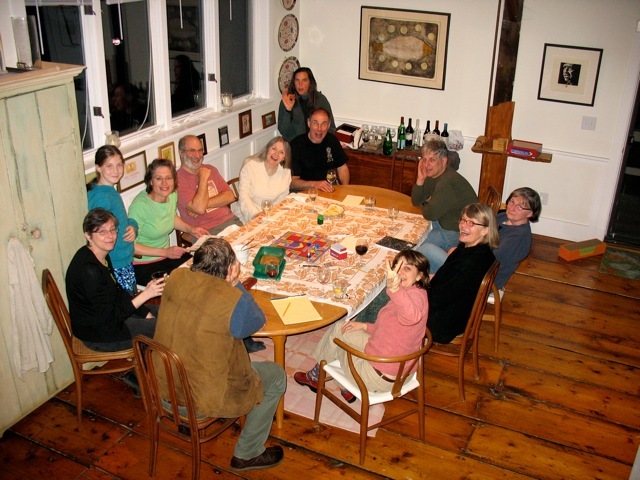 To learn more about this loosely but warmly knit group, visit ChathamArt. Based in Columbia County, NY. This entry was posted in Art, Fine Crafts by Katharine. Bookmark the permalink.